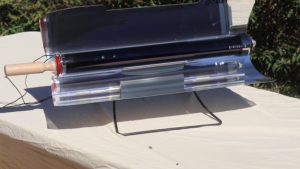 This recipe is one of a series that features the GoSun Sport Solar Cooker. 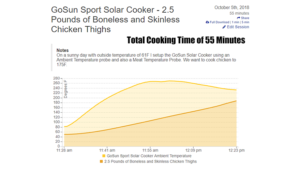 The Challenge – from a room temperature GoSun Sport to cooked boneless and skinless chicken thighs that reach an internal temperature of 185F in under 60 minutes. 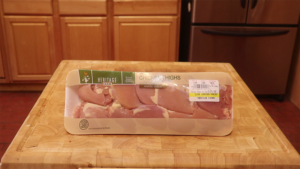 We first start off with 3.3 pounds of boneless and skinless chicken thighs. The GoSun Sport manual says that it can handle up to 3 pounds of food so this should be a good test. 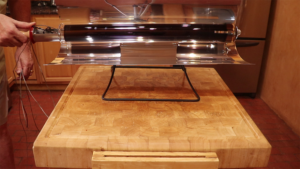 The cooking tray is made out of stainless steel so it is best to spray the inside of the tray with a cooking oil. 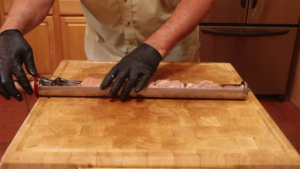 When loading the chicken thighs it is best to start from the other end away from the handle. Now, this is important and differs from what you would do in a conventional oven. Pack the chicken in as tight as you can. Because you are cooking with radiant heat and not hot air there is no need have any air spaces. Also because I had to make room for the ambient temperature probe I could only put 2.5 pounds of chicken in the tray. Without that probe, it would have held a full 3pounds of chicken. Enough chicken for 3 to 4 people if served with a salad. I learned a long time ago the best way to cook food is by temperature and not time. 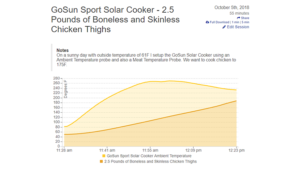 So we will be monitoring both the chicken temperature and also the ambient or air temperature inside the cooker. 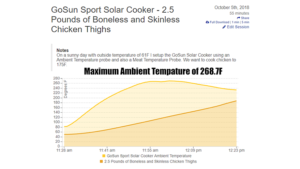 Our target temperature will be 175F for the chicken. 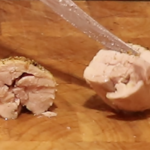 When placing the meat temperature probe make sure it is in the middle of the thickest part of the thigh. Also, make sure you are in the middle of the tray and stay away from the space by the handle. Another very important part of using the GoSun Sport is do not preheat the cooker. 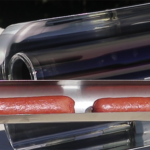 The cooker gets real hot, real quick in the sun but the cooker can actually get too hot if it lacks food in the chamber. You have been warned. With food loaded it is time to put the cooker in the sun. Just point the cooker as direct as you can by looking at the cooker shadow. You do not need to be perfectly aligned and don't worry it is going to get hot. REAL HOT. 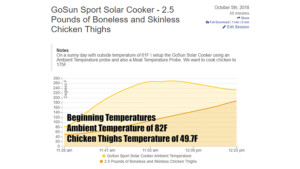 Here is the temperature chart of both the chicken temperature and the ambient temperature. A note is the ambient temperature was actually not correct. Because it was near the opening and as the food got above 212F or boiling it produces steam. A lot of steam. That steam is water evaporating and evaporating water has a cooling effect on the probe so the real temperature was much higher. Now here is where I made a mistake but also found out the cooker is extremely forgiving. I lost track of time and cooked the chicken to 187F or 12 degrees hotter than my target. Now in a regular oven that could end up drying the chicken out or makes it mushy. The total cooking time to get to 187F was only 55 minutes. Remember this was without any preheating. So when the cook was complete here is what the chart recorded. Ambient temperature was 232.7F but we know that was not correct due to cooling affect from the water evaporating. 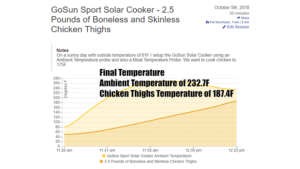 Final chicken temperature was 187.4F or 12.4F hotter than our target. Total cooking time 55 minutes. 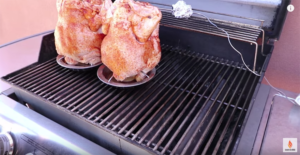 What we found out is because the chicken is being cooked using radiant heat and not hot air the chicken never dries out. That is why the cooker is so forgiving. In this picture, you can actually see the steam. 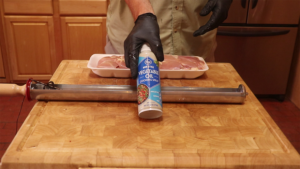 Also, please note the outside of the tube NEVER gets hot but where the steam comes out gets really hot so please use heat resistant gloves when removing the food. Here is what the chicken looks like when removed from the tray. It is very moist and extremely tender. I could and did easily cut it with the side of a fork. Check out the video below to see that section. It also tasted great for the seasoning, due to the steaming effect the seasoning, especially the salt permeates the meat. 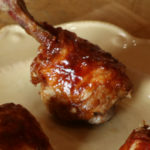 If you have not guessed by now this recipe is about making Lollipop chicken. 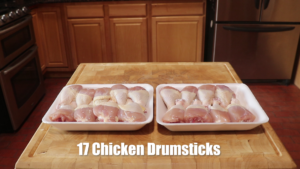 I was having a small group of people over so I got two chicken packs for a total of 17 drumsticks. I was having a small group of people over so I got two chicken packs for a total of 17 drumsticks. There is some work involved so I took both packs and combined them into one foil pan that will also be the cooking container. Safety first I always wear disposable kitchen gloves when I handle raw chicken. The first step is to make a complete cut around the leg about one inch from the knuckle. There are some tendons so make sure you cut all the way through. Now pull the meat and the skin together and away from the knuckle. 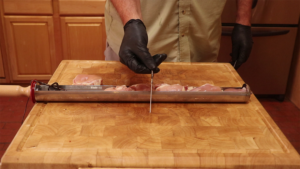 Using kitchen scissors trim the tenons away from the meat. 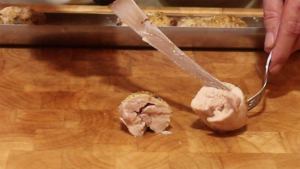 Now the last part of making this chicken look like a lollipop id remove the joint from the knuckle. 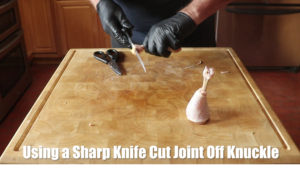 With a small and sharp knife get under the joint and cut it away from the knuckle. This usually takes two to three cuts before you can remove the complete joint. As you see this takes some time and you need to be careful. Next thing is to add the Gold Star Chicken rub. 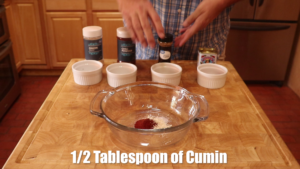 This is now my goto rub for most chicken recipes. Make sure you cover every inch of the meat and skin. Get a measuring cup that can handle being in the microwave. Get one stick of unsalted butter and put into the cup. Now off to the microwave using the melt butter mode or on low power. You do not want to overcook the butter. Pour melted butter into the bottom of the pan. Be very care for you want to add the butter to the bottom of the pan without getting butter on the skin of the chicken. 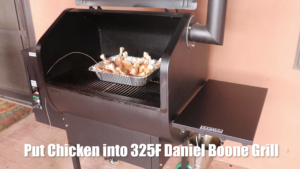 Put chicken into a 325F preheat grill like the Daniel Boone. And if you do have a Daniel Bone grill with Wifi you can program the grill to do the complete cook from this point on. What you see is a profile that I set up for this cook. There are two steps to the profile and both are based on reaching a temperature. Step one is running the grill at 325F. Stay at this grill temperature till the meat probe hits 165F. At that point, we go to step two which will increase the grill temperature to 400F. Will maintain that grill temperature till the meat probe reaches 185F. At that point, the grill will shut itself off. What we are looking Is the beginning of step two where put foil on the knuckles and add a glaze to the chicken. The glaze is Southwest Sweet Heat BBQ Sauce. This sauce is a very balanced sweet sauce but with a kick of heat at the end. I let the lollipops rest for about 5 minutes. The lollipops had a great color and were well cooked. The skin was completely rendered and you could easily bite through. But the best part was the taste. 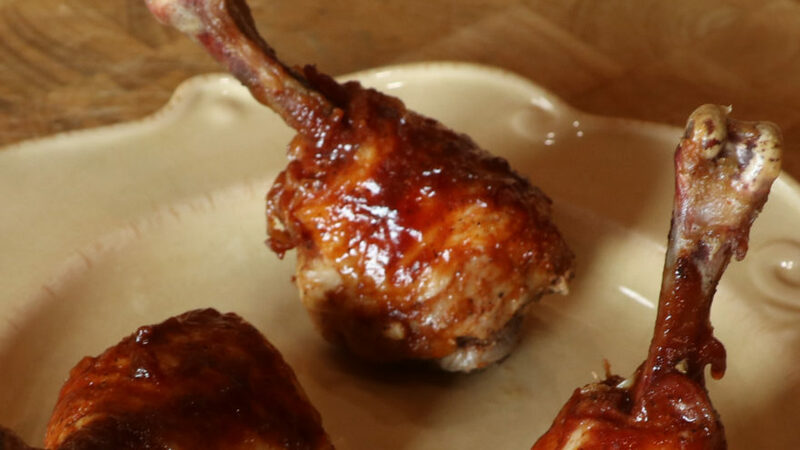 Between the rub and the glaze, these lollipops were flavor bombs. 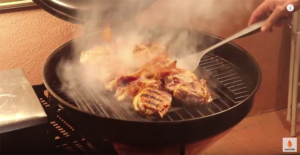 This recipe we are cooking beer marinated chicken thighs on the Rec Tec Trailblazer. 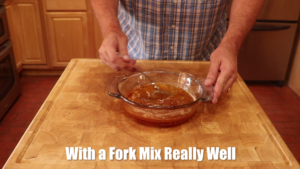 Making the marinade is very straight forward but there are a few steps. 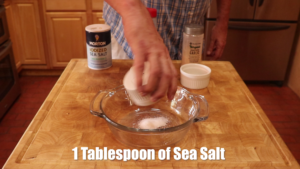 One Tablespoon of Sea or Kosher Salt. 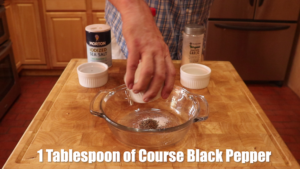 One Tablespoon of Course Black Pepper. 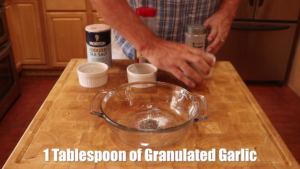 One Tablespoon of Granulated Garlic. 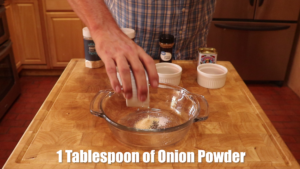 One Tablespoon of Onion Powder. 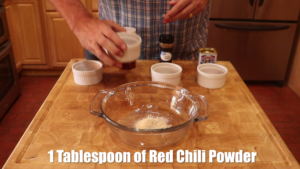 One Tablespoon of Red Chili Powder. 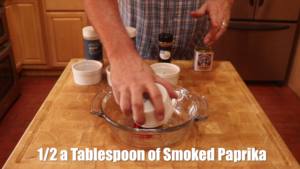 One Tablespoon of Smoked Paprika. 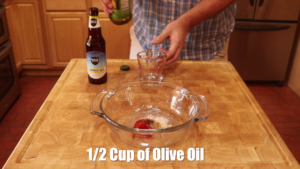 1/2 Cup of Olive Oil. 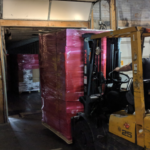 1 & 1/2 Cups (12 oz.) of a Good Kraft Beer. 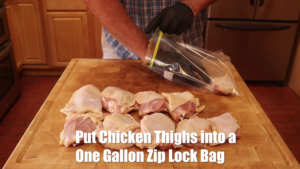 Place 10 Chicken Thighs in a One Gallon Zip Lock Bag. 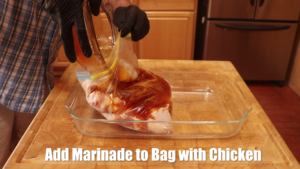 Pour Marinade into the Bag with Chicken. Try and get most of the air out of the bag. 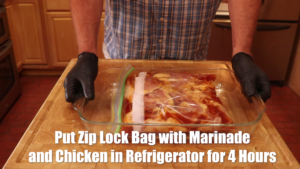 Place Bag with Marinade into the refrigerator for at least 4 hours. Remove chicken from bag and place on frogmat. 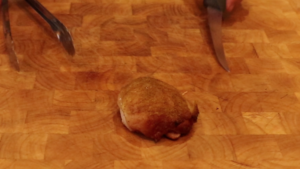 Make sure that chicken skin covers the top side of the chicken thigh. 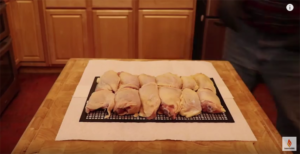 Place Chicken on Frogmat into Pre-heated Grill set at 425F. Put meat probe into thickest thigh in the middle of the Frogmat. 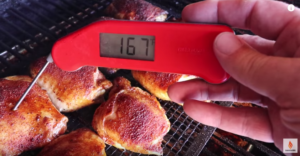 Pull Chicken when internal temperature hit 175F. 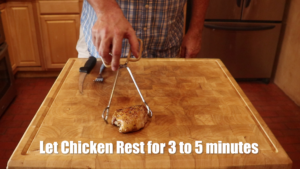 Rest Chicken for 3 to 5 Minutes. Then Serve. I will be cooking adobo chicken thighs with garlic and jalapeno seasoning. 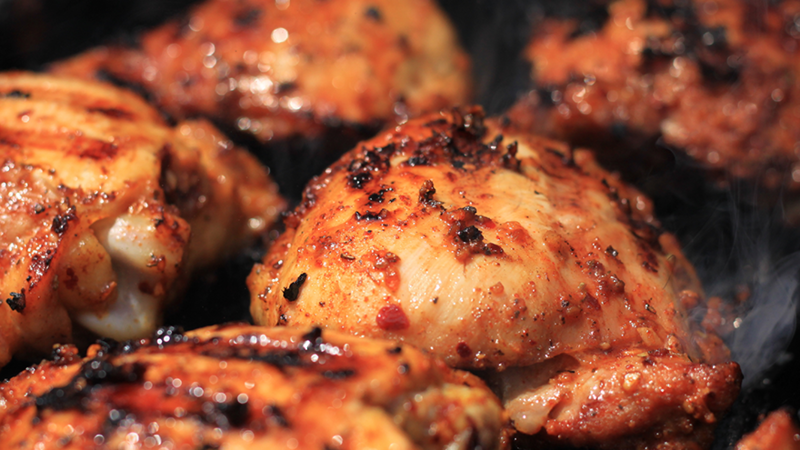 When cooking thighs for competition or just having the neighbors over the skin can either make or break the cook. If undercooked the skin is rubbery and if burnt well it is burnt. You can see as I prepare these thighs I pull the skin back over the meat and get rid of any folds or gaps. We will be applying two seasonings. The first is Adobo with pepper. 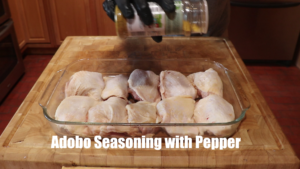 The adobo seasoning first ingredient is salt and we want to make sure the chicken skin is fully covered. 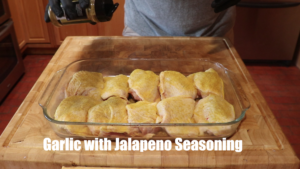 The second seasoning is garlic jalapeno and has a bite so add based on your tolerance to spicy foods. Now it is off to the refrigerator to sit uncovered for 6 hours. Get a Frogmat and position the thighs evenly on the mat. The reason the chicken sat for six hour is the salt acted as a dry brine and also dried the chicken skin. Now it is off to the 425F preheated Daniel Boone Grill. Position the chicken right in the middle of the grate. After 30 minutes start checking for doneness. The minimum temperature has to be 165F. 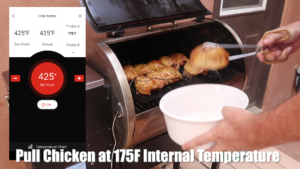 I usually pull the chicken when all pieces are at least 170F to 175F. The chicken is done. The skin is crisp and not rubbery and it is also a nice golden brown. Now some observations about the Daniel Boone Grill. It held the 425F temperature extremely well. Also the chicken cooked very evenly meaning there no hot or cools spots inside the chamber. For this hot and fast cook I give it very high marks. Now on to the finished chicken. The skin was crisp and the meat was cooked through but very juicy. The adobo with garlic gave it a lot of extra flavor and the jalapeno gave it a nice kick. Here I just eat the skin and it was really good. Overall I gave it one big thumbs up. As I just keep on eating let close with the three things that made this a great cook. Great seasoning and drying the skin in the refrigerator. Cooking hot at 425F and last a great grill like the Daniel Boone. 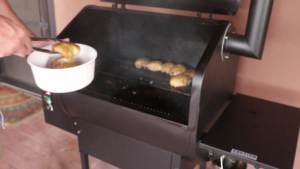 Hot and fast chicken thighs on the Rec Tec Bullseye Pellet Grill. 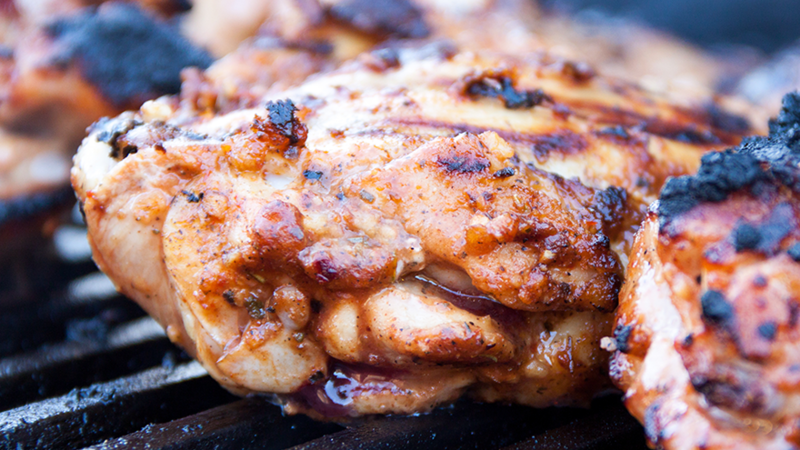 How about from cold grill to finished chicken in 45 minutes or less. To start we need to do a few things. First Layout two paper towels. Then put down a frogmat or grill mat. Just make sure it can handle the high temperature of at least 500F. 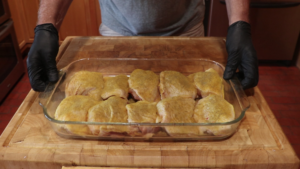 Now lay chicken thighs out with the skin facing up. To make this easy we are going to use a pre-made rub. The rub we are using is Grill Mates Tennesee Whiskey Chicken Rub. One teaspoon of rub has only 2 grams of carbs so is safe for those that are on the Keto diet or are pre-diabetic like my self. After rub is applied to skin side turn chicken over and then apply on the back side. 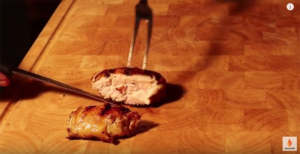 Please note that when you are done with the rub the chicken is sitting on the grill mat with skin facing down. 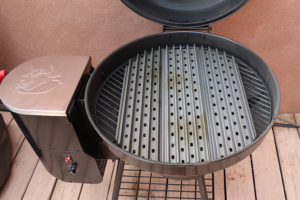 Here is the bullseye with the grillgrates in place and on high or knob turn all the way to the right. 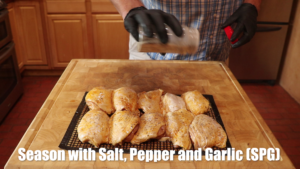 After preheating for 8 and ½ minutes put chicken it the center of the grillgrates. Now close lid. And set a timer for 15 minutes. Check ambient or air temperature inside the grill and it should be 500 F.
After 15 minutes check skin to see it there are grill marks. 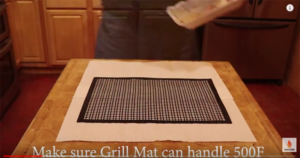 Even with the grill mat in the way, the grillgrates will still leave grill marks. With grills marks in place and the skin well rendered, it is time to turn the chicken over. Now you see all that smoke. Well it is not from the pellets. It actually the fat that is being rendered that drips onto the really hot grillgrates. As the fat vaporizes it is creating a wonderful flavor that is going right back into the chicken. After turning the chicken let it cook for another 15 to 20 minutes but you have to start checking the temperature no later than 15 minutes. When all the pieces are a minimum of 175F then it is time to pull the chicken. So how did it come out? The grill rook 8 ½ minutes to warm up and the lichen too a total 34 minutes to cook. That is a total time of 42 and ½ minutes. But is cooked all the way through? You can see the grill marks and the skin is firm. As I cut through there is nothing rubbery about this skin. Also, you can see it is well cooked and cooked all the way through The meat is very moist and very easy to cut. So how does it taste? What can I say? Once you go hot and fast you never want to go back. 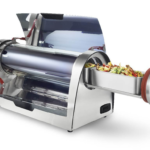 The Bullseye is a hot and fast searing machine. 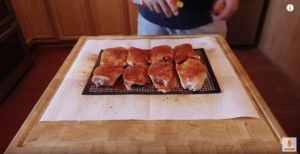 I challenge anyone to see if the can completely cook chicken thighs in less than 45 minutes and do this without burning the chicken or burning down your house. On the Rec Tec Bullseye grill, we will be cooking chicken wings and making a special Alabama white BBQ Sauce. This white sauce is very popular in Alabama but now has a strong following all over the US. Big Bob Gibson gets the credit for making this white sauce in his restaurant in Decatur, Alabama. Bullseye Grill. GrillGrates - 22 inch round. 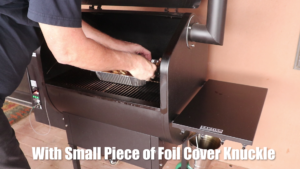 Frogmats or wire rack to insulate from GrillGrates. ThermoPro TP20. First we will start with a simple but really good rub. Just two ingredients. 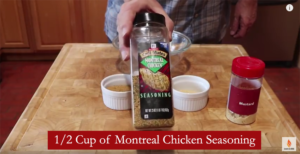 1/2 Cup of Montreal chicken seasoning. Mix the two ingredients together well. Put off to the side for later. Now it is time to make the sauce. 2 cups of mayonnaise. 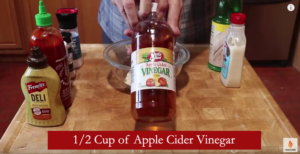 1/2 a cup of apple cider vinegar. 1 teaspoon of prepared horseradish. 2 tablespoons of spicy mustard. 1 big tablespoon of sriracha sauce. 1 teaspoon of onion powder. 1 teaspoon of garlic powder. Whisp till the sauce is smooth with no lumps. Now put the sauce in the refrigerator and let sit for about an hour. Here are the chicken wings. Yesterday I lightly salted them and let them sit in the refrigerator for 24 hours. This allows the skin to dry out and hopefully eliminate rubbery chicken skin. Now it is time to apply the rub. Because the wings are small I like to apply the rub with my hands. 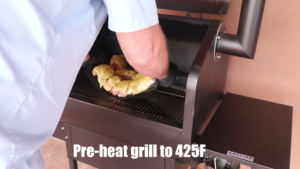 Preheat Bullseye Grill to 450F. 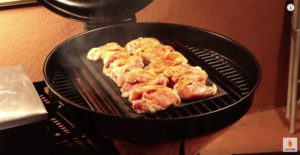 Place wire rack of chicken wings on top of GrillGrates. You could also use frogmats if you prefer. 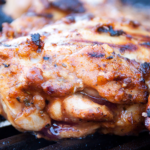 Make sure that the chicken does not overhang the GrillGrates or it could burn. After 20 minutes turn chicken wings over. Ater another 20 minutes chicken wings will be done. 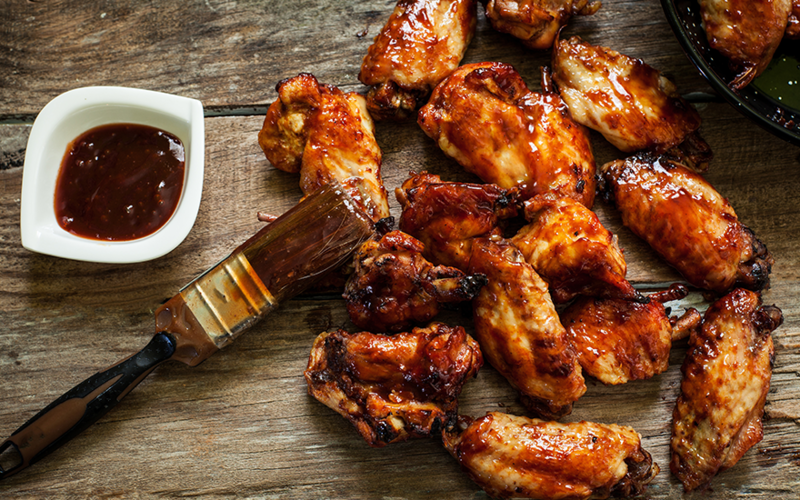 Make sure everyone has their own plate of wings with a small dipping bowl with the Alabama white BBQ sauce. 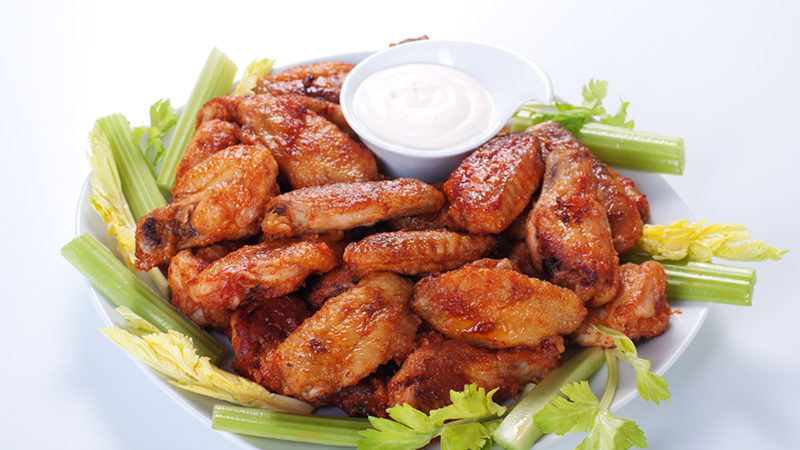 Chicken wings will have a brown and firm skin that is not greasy. 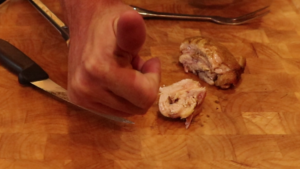 The chicken meat will be very juicy and should not be hard to take off the bone. 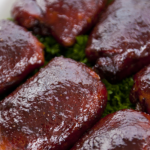 This recipe is easy and uses a championship rub that has actually won championships. If you want to impress your family and friends then this is the recipe for you. 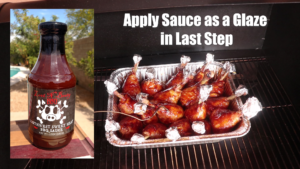 Also if you just got your new BBQ grill or smoker then this recipe will make you look good. This recipe is very easy. First, you buy the rub so you do not have to make anything. 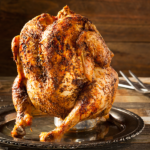 The Rub is Plowboys Yardbird Rub and if you are trying to find it click on the name in the list of ingredients above. This is the rub from the team that won the 2009 American Royal Invitational. From the team of Todd Johns and his brother-in-law Randy Hinck (who compete as the Pork Pullin Plowboys) who bested 123 past grand champions to capture the overall crown. So it has actually won championships so it makes your job easy. 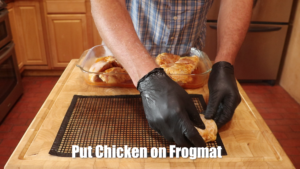 I highly recommend you use frog mats and use installed food handling gloves. If you watch the video below you can get a good idea of how they all work together. 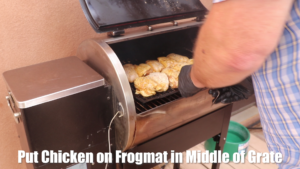 The frog mats will allow you to handle eight chicken thighs at the same time and the gloves will totally eliminate having to use tongs or a spatula. Also, makes cleanup a breeze. 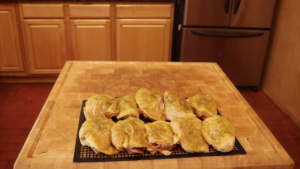 I put eight chicken thighs on to one frog mat. I then apply the rub to the chicken thighs. This rub has a lot of salt so beware if you are salt intolerant. Also, you really want to make sure you cover all the skin. 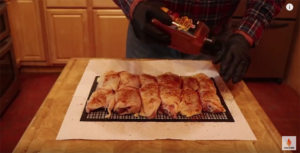 After applying the rub I spray the chicken with spray-on cooking oil. The oil does two things. First, it keeps the rub in place and second it will allow the chicken skin to crisp up. While I am doing all the prep I preheat my smoker or grill (using indirect cooking method) to 350F. Do NOT cook at a lower temperature for the chicken skin will become rubbery. 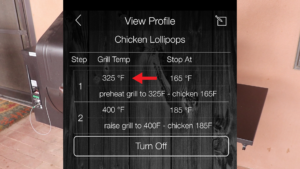 You also need to bring the internal chicken temperature up quickly and it has to cook above 165F to be safe. I do not pull the chicken until I read at least 165F in the thickest part of the thigh but not touching bone. This is usually at least an hour and on my smoker, it is one hour and fifteen minutes. 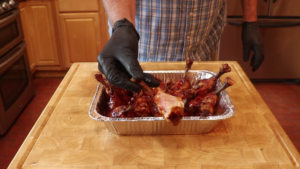 Now with your insulated gloves you can now take the chicken off the grill or grate and let it sit for about five minutes and then serve. Gai Yang originated in Isan, Thailand's Northeastern region that is largely populated by Thai Lao people. It is one of those dishes that is so good it has spread to all corners of the country and the world. 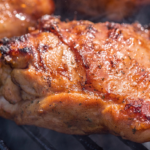 This is a favorite barbecue recipe. 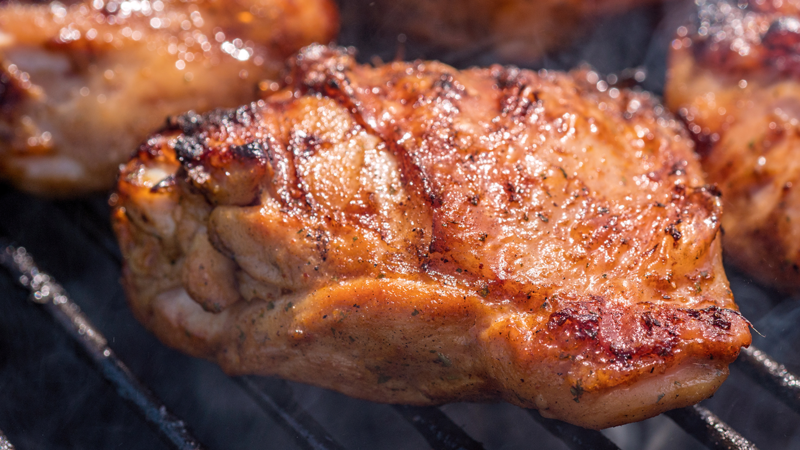 The enticing aroma of the sizzling meat on the grill makes it very popular with the street vendors' clientele. 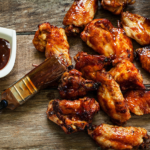 Combine all the marinade ingredients and marinate the chicken wings overnight. 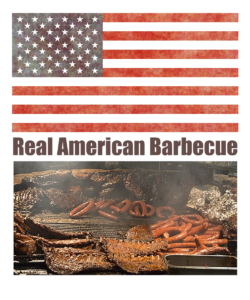 Barbecue the wings over medium coals using direct heat for 10 to 15 minutes on each side or 425F in a smoker for 30 to 40 minutes or until they are cooked through and golden brown. Serve with steamed sticky rice. Keto diet note: There is one tablespoon of light brown sugar in this recipe. That represents 13 grams of carbs for 1.5 pounds of chicken wings. 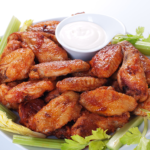 If you eat 1/2 pound (a lot of wings) your carb intake would be 4.3 grams and If your carb limit is 20 grams a day (like mine) you can still eat some chicken wings and stay within the 20-gram limit. 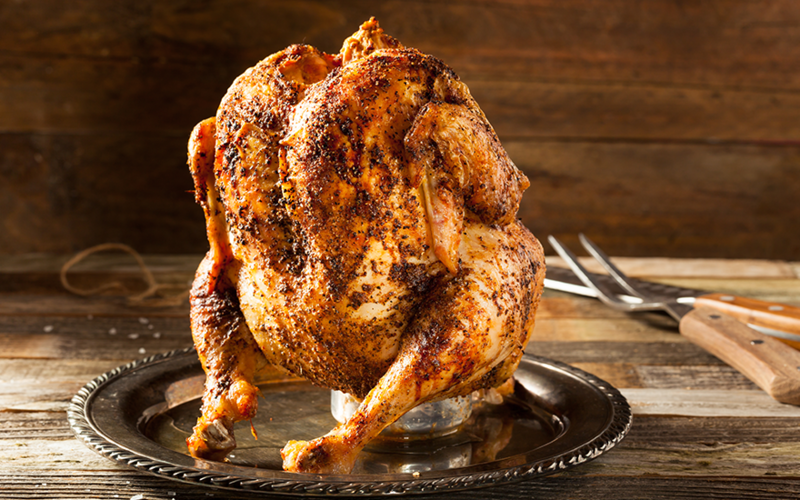 This recipe is easy and uses a championship rub (Plowboys, Yardbird Rub) that has actually won championships. 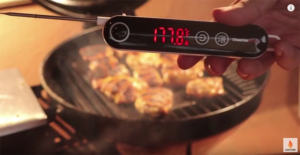 If you are using a grill it is very important to use a remote thermometer. Opening the cover to check temperature will make a long cook even longer and might stop food from reaching a safe to eat temperature. Place chicken on at least half full beer cans. 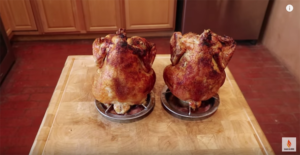 If they are large chickens then I would recommend beer can chicken stands that will hold both the chicken and the beer in place. Then spray the oil on the skin of the chicken. The oil will do two things. First, it will hold the rub in place but even more important it will allow the skin to crisp and brown for no one wants rubbery chicken skin. Now it is time to add the rub and I use Plowboy Yardbird rub and I make sure the bird is fully covered. I then bring the smoker or grill up to 350F as I finish the rub. 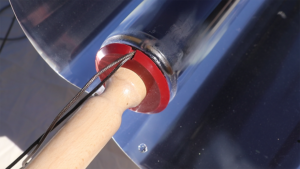 Insert the remote thermometer probe in the thickest part of the thigh without touch the bone. 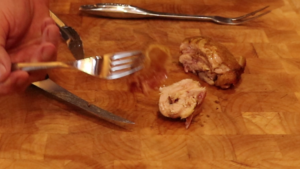 If you are cooking two chickens then you need a probe in each one for they will not cook the same and you will need to pull one chicken before the other. Here is where the remote thermometer makes a huge difference. Because you do not need to open the lid you can keep a constant 350F around the chickens. When one reaches 165F to 170F then it is time to take them off the grill. I leave them on the can or rack for about 5 to 10 minutes before I serve them. The keys to success are oil on the skin so it crisps and browns, the remote thermometer so you do not have to open the lid and the thermometer will let you cook to temperature and not guess using time. 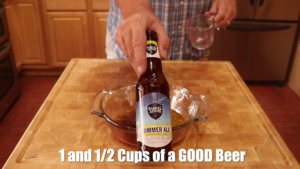 Now there are some very good websites (Amazing Ribs) that actually say the beer can cause more harm than good for it slows down the cooking on the inside due to the fact that it takes the liquid longer to get warm and the outside can overcook. Also that it does not really add much moister to the chicken. 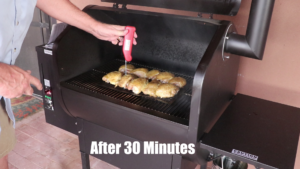 That might be true for it does take longer to cook the chicken at 350F than if I just cooked the chicken without the beer can. But I have a smoker that actually works like a convection oven. I also always cook large chickens (more than 6 pounds). 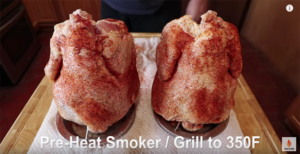 So the reason I have such good luck with beer can chicken is that the heat is evenly distributed and also I believe that the breast (next to the beer can) cooks a little slower than the legs and thighs that are further away from the can. 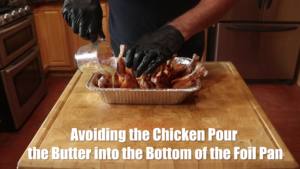 I also pull the chicken the moment it is 165F to 170F in the thickest part of the thigh. I like doing beer can chicken for it is always consistent and I like the idea of giving someone a half of a whole chicken to eat than a bunch of chicken parts. Myron Mixon was quite literally born to barbecue. His father, Jack, owned a barbecue take-out business in Vienna, Georgia, which Myron helped run. His parents started selling Jack's Old South Barbecue Sauce, and after his father died in 1996, Myron thought that by entering competitions he could sell some sauce. He was hooked. He has appeared on the Today show, The Tonight Show with Jay Leno, and the Late Late Show with Craig Ferguson. 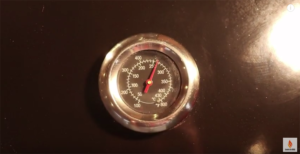 Preheat a smoker to 300˚F. 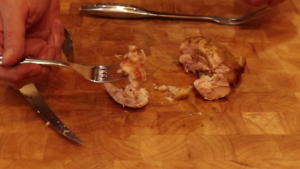 Using poultry shears, remove the knuckle on each end of each chicken thigh bone. 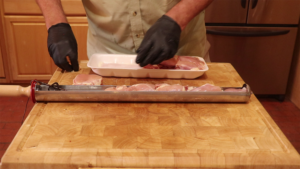 Then trim the excess fat off the skin and meat of each thigh until the pieces are 3 to 4 inches wide, leaving about 1/4 inch of excess skin at the edges of the meat. 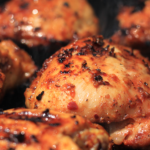 Apply the chicken rub evenly to both sides of the thighs. In the cupcake mold, place each thigh, skin side down, in an individual cup. 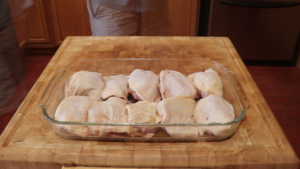 Set the mold in the baking pan, and pour the chicken broth into the pan, being careful not to pour it directly on top of the chicken. Place the pan in the smoker and cook, uncovered, for 1 1/2 hours. Remove the baking pan from the smoker. Gently flip the thighs onto the baking sheet. Season the tops of the thighs with salt and pepper. Return the thighs to the mold cups, skin side up, and put the baking pan back in the smoker. Cook for 45 minutes. Meanwhile, make the sauce: Put all the sauce ingredients into a blender and blend until thoroughly combined. In a medium pan over medium heat, warm the sauce until it is hot but not boiling. Set aside. 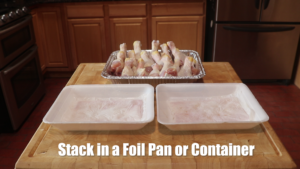 Remove the pan from the smoker, and unmold the chicken thighs onto the baking sheet, skin side up. Brush the thighs lightly with the warm sauce. 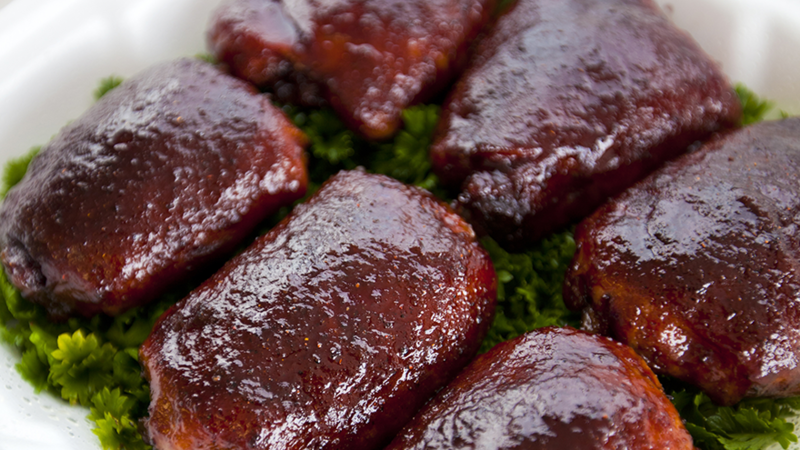 Place the baking sheet in the smoker and cook for 30 minutes to allow the sauce to caramelize into the chicken skin. 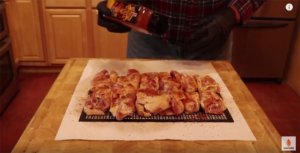 Remove the baking sheet from the smoker, and serve the cupcake chicken immediately.